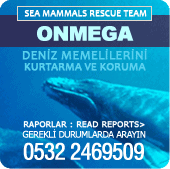 A commendably brave act of international cooperation in Fethiye, instigated and organised by marine biologist Meryem Tekin, has saved one of the rarest species of whale ever sighted on the Turkish coast. 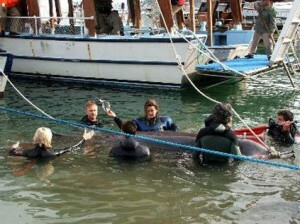 The adult female Sowerby’s Beaked Whale measured just less than 5 metres and weighed approximately one tonne. ‘There have been erroneous reports describing it as a dolphin but when its size and features are understood there is no question of what it is.’ Says Tekin. On Friday 9th January 2009 a large grey creature was seen wallowing in the water around the boat yard well inside the bay of Fethiye. Fethiye’s resident marine biologist Meryem Tekin donned her wet suit and boots to examine the new arrival. The large, grey creature was wallowing in the shallows, underneath the hulks of yachts and gulets and surrounded by the paraphernalia expected in an industrial area. Not the most accessible place to do a full examination and to instigate a rescue.